I’ve been looking forward to today’s post for a long time! We’ve gone through so many different ways of synthesizing ethers, and finally we get to talk about all the exciting things we get to do with them. We have now covered the reactions of ethers. Is that it? Yes, really: the only significant reaction of ethers you need to know…. is how to break them. Does this make ethers the most boring functional group there is? Yes!!! (as long as you don’t count alkanes as a “functional group”). So, you might ask – what’s the point? All I’ll say for now is that there are some times when “boring is good”. Ethers, as we’ll learn later, can be useful as “protective groups” for masking (reactive) alcohols. But that’s a later discussion. 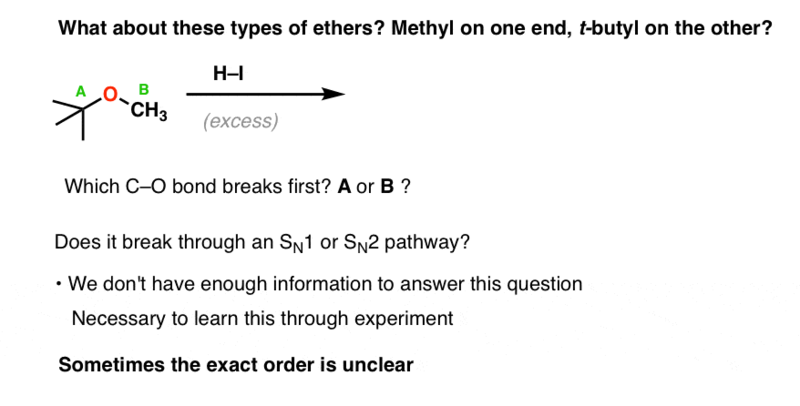 Right now, let’s dig in to how this ether cleavage reaction works, because it actually does have its subtleties. This discussion should be pretty straightforward if you’ve been following along, however, because it’s just going to involve the familiar mechanisms of protonation, SN1 and SN2. Neutral ethers are generally resistant to nucleophiles in substitution reactions – that’s because the leaving group would have to be RO- , which is a very strong base. For that reason, the first step in any ether cleavage is protonation by a strong acid. Why does protonation help us? Remember that the “conjugate acid is always a better leaving group” . Protonation of the ether allows for loss of ROH as a leaving group, which is a vastly weaker base than RO- . This is going to set up our next step – cleavage of one of the C–O bonds. The usual strong acid of choice is usually hydroiodic acid (HI). Not only is it powerful (pKa of –10), as we’ll see the iodide counter-ion plays a role as well. After protonation, what happens next? 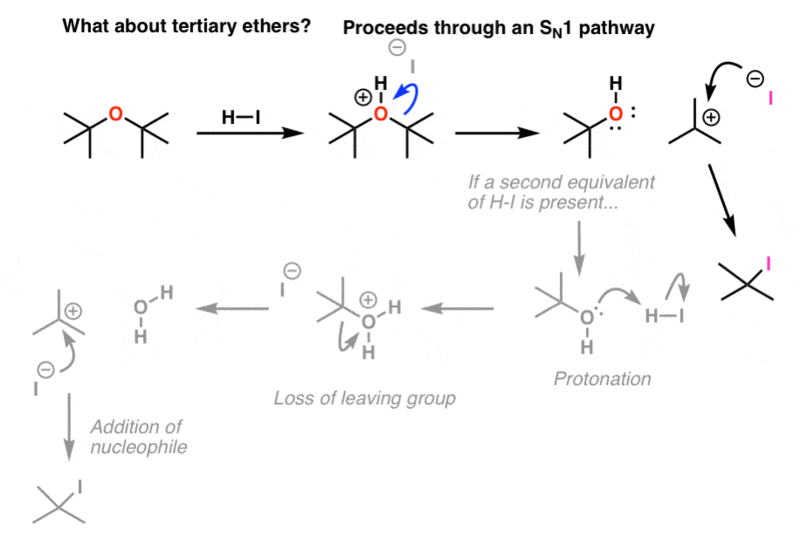 If we start with a primary ether like diethyl ether, we will have a good leaving group (ROH) on a primary carbon in the presence of a decent nucleophile (iodide ion). Sound familiar? It should – these are ideal conditions for an SN2 reaction. And that’s what happens. The product will be ROH and R-I . 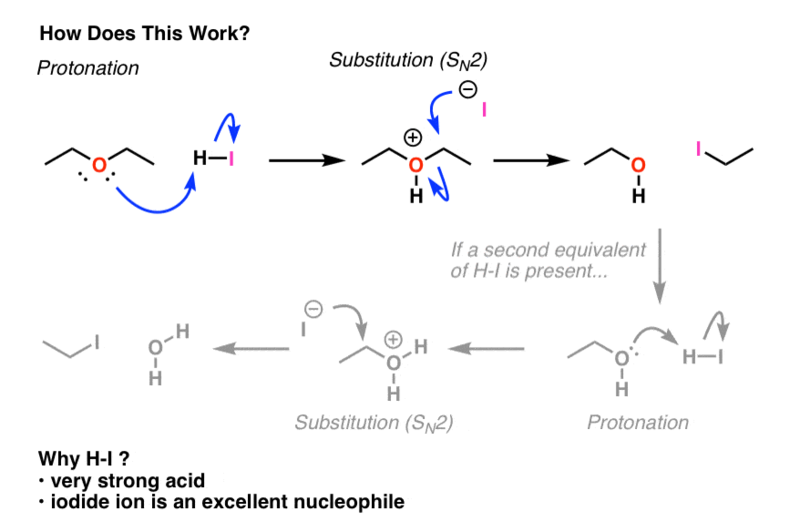 If an excess (2 equiv or more) of HI is present, that alcohol can be converted into an alkyl iodide through two subsequent steps (protonation / SN2). This “SN2” pathway will be dominant for primary and methyl ethers. What about a symmetrical tertiary ether like di-t-butyl ether? Again, if excess HI is present then that alcohol will be converted into an alcohol. We’ll have more about that to say in a few posts actually. What about secondary ethers? I don’t have a good answer. SN1 and SN2 is a continuum. You’ll likely have a mixture of SN2 and SN1 pathways operating. If someone tells you they can look at an ether like di-isopropyl ether and the SN2 or SN1 pathway will be 100% dominant, that’s just not true. Just as tricky as the case of secondary ethers is the case of “mixed” ethers. What if you have two different groups attached to the oxygen (“unsymmetrical ethers”). Which way is it going to break? For example, what about t-butyl methyl ether? When you treat it with acid, what happens first? Do you do an SN2 on the methyl group with iodide, or does it ionize to give a tertiary carbocation? This is the type of question that is NOT easy to answer without knowing the results of experiments. There are, however, a few cases of mixed ethers where there IS a straightforward answer. Take this question for example. What happens? The answer is very clear and it goes 100% one way. See if you can do it. If you’re curious about the answer, you’ll have to leave a comment. OK. So ethers, as we’ve talked about them so far, ARE pretty boring. But (and there’s always a but) – there IS a special class of ethers which is, in fact, very interesting and very reactive. If you’ve covered alkenes, you’ve seen them before – but under a different name. Can you guess what functional group I’m talking about ? Next post! Phenol is indeed one of the products. Another informative article. About the question at the end, will HI add to anisole to give Iodobenzene? Think about the SN2 reaction. It has to go through a backside attack. Is one SN2 more favoured than the other? First step is the protonation of the oxygen, leaving a positive charge on the latter. – A Sn2 reaction. After Protonation of the oxygen, there is a nucleophilic attack of the iodide to the methylcarbon, generating Phenol as leaving group and Methyl-Iodide. Another possible consideration would be the nucleophilic attack of iodide at the rather electron-rich aromatic carbon connected to the oxygen. That wouldn´t be a reasonable mechanism. Why is the benzylic cation unstable? I thought it would be stable because of resonance. Ah – what you call the “benzylic” carbon is actually the phenyl cation (C6H5+). The p orbital of the carbocation is in the same plane as the hydrogens in the benzene ring – perpendicular to the pi bonds which would be able to stabilize it through resonance. What we term the “benzylic” carbon is actually C6H5CH2+ . This has a carbocation adjacent to a phenyl ring, which CAN be stabilized by resonance. I should write a post on this common source of confusion. Yeah who decided that “benzene” is C6H6 yet C6H5 is a “phenyl” group and that a “benzyl” group refers to benzene with a methyl attached to the ring? I think it is a source of confusion for many who are new to O-chem. The article is great. Thank you for sharing. Hope to hear more from you. Don’t say that this is the one and only possible reaction to an organometallic chemist! Ha. Well, it’s the one key reaction undergrads learn in introductory courses. Yeah, sure. To advance that on slightly, you can discuss the mechanism of deprotection of methoxy groups by BBr3, being not far removed from that which you have written about. In the paragraph under “Case #2 – Tertiary Ethers”, I believe “Again, if excess HI is present then that alcohol will be converted into an alcohol” should read “alcohol will be converted into an alkyl iodide” instead. Isn’t iodide a weaker base than water which would make it a better leaving group? Also, how does iodide being both a good nucleophile (polarizable) and a good leaving group (polarizable) add up? Which take precedence? Wouldn’t the methyl/ethyl carbocation react back with the newly formed compound to give back the original compound as they both are excellent bases? can ethers react with hcl? Generally, HCl will be poorer at cleaving ethers than HI. So why are MOM protecting groups typically removed with HCl?